Ancient skulls discovered in a Spanish cave exhibit a mix of Neandertal and more primitive characteristics, implying that Neandertals developed their defining traits in stages. From studying a collection of skulls in a Spanish cave researches have identified both Neandertal-driven features as well as features linked with more primitive humans in these bones. This “mosaic pattern” supports a theory of Neandertal evolutions that suggests Neandertal’s defining features were in fact developed separately and not all at once. This data from the Sima de los Huesos site, the Spanish cave, has allowed scientists to gain a better knowledge of hominin evolution the Middle Pleistocene, a period which has been deemed controversial in the path of hominin evolution. “The Middle Pleistocene was a long period of about half a million years during which hominin evolution didn’t proceed through a slow process of change with just one kind of hominin quietly evolving towards the classic Neandertal,” said lead author Juan-Luis Arsuaga, Professor of Paleontology at the Complutense University of Madrid. Approximately 400 to 500 thousand years ago, in the centre of the Pleistocene, archaic humans split off from other groups living in Africa and East Asia, which led to their settling in Eurasia, where they developed traits that later defined the Neandertal lineage. Several hundred thousand years later, modern humans, who evolved in Africa, settled in Eurasia as well. They interbred with Neandertals, but even at this time, displayed signs of reproduction incompatibility. As a result, modern humans ultimately replaced Neandertals. The extent of the deviation between Neandertals and modern humans over a short time period has stunned scientists. Questions have been raised as to why Neandertals differentiated so rapidly from other early hominins? Another area to question is what pattern of changes did Neandertals undergo? To answer these questions, scientists required an accurate picture of European populations from around 400,00 years ago, which is said to be the early stages of Neandertal lineage. However, this has become a challenge because the European fossil record-one of the more important tools in answering these questions- is both isolated and dispersed. Samples from Sima de los Huesos in Atapuerca, Spain, are different. It has been discovered that the 17 skulls belong to a single population of fossil hominin species. Some of these species have been investigated previously, but seven that have been presented are new, and six have that have been discovered are more complete than what has been seen previously. Having access to intact samples has enabled the researches to progress in the characterization of defining features. 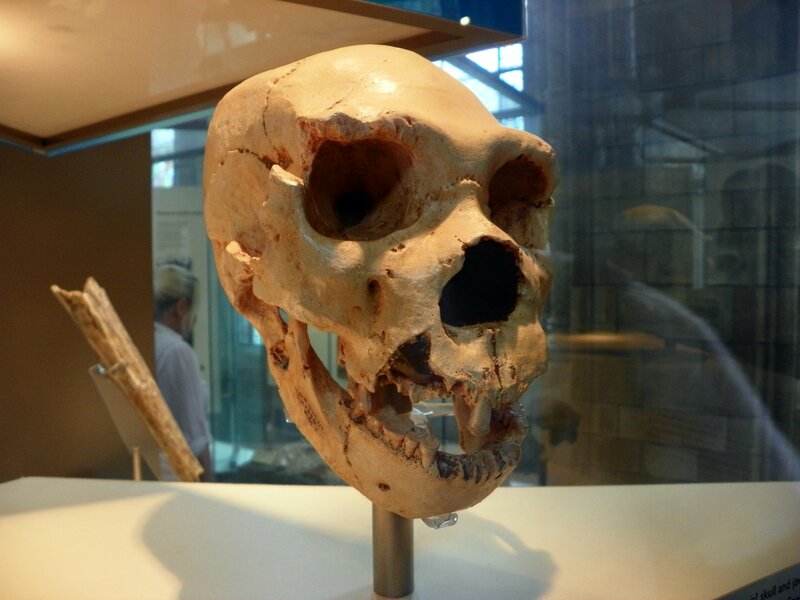 Their work has aided in addressing hypotheses about Neandertal evolution, especially the accretion model hypothesis, suggesting that Neandertals evolved their defining features at different times, rather than all at one time. The skull samples displayed features present in the face and teeth alone; for example the nearby braincase showed no features connected with more primitive hominins. “We think based on the morphology that the Sima people were part of the Neandertal clade,” Arsuaga said, “although not necessarily direct ancestors to the classic Neandertals.” They were part of an early European lineage that includes Neandertals, but is more primitive than the later Pleistocene variety. Crucially, many of the Neandertal-derived features observed were related to mastication. “It seems these modifications had to do with an intensive use of the frontal teeth. The incisors show a great wear as if they had been used as a ‘third hand,” typical of Neanderthals,” Arsuaga said. The work that was conducted by Arsuaga and his team implies that the first step in Neandertal evolution was facial modification. This prediction is supported by the “mosaic pattern” fitting the accretion model. Indeed, other European Middle Pleistocene Homo sapiens do not display the Neandertal-derived features that have been discovered in this particular fossil group. Therefore, it appears that more than one evolutionary lineage coexisted during the European Middle Pleistocene, which has been represented by the samples discovered in the Sima de los Huesos site being closer to the Neandertals.